His lips are sweet, His face is sweet, His eyes are sweet, His smile is sweet, His heart is sweet, His gait is sweet—Everything is sweet about the Emperor of sweetness! His words are sweet, His character is sweet, His dress is sweet, His belly-folds are sweet, His movements are sweet, His wandering is sweet—Everything is sweet about the Emperor of sweetness! His flute is sweet, His foot-dust is sweet, His hands are sweet, His feet are sweet, His dancing is sweet, His friendship is sweet—Everything is sweet about the Emperor of sweetness! His singing is sweet, His yellow cloth is sweet, His eating is sweet, His sleeping is sweet, His beauty is sweet, His tilaka is sweet—Everything is sweet about the Emperor of sweetness! His deeds are sweet, His liberating is sweet, His stealing is sweet, His love-sports are sweet, His oblations are sweet, His tranquility is sweet—Everything is sweet about the Emperor of sweetness! 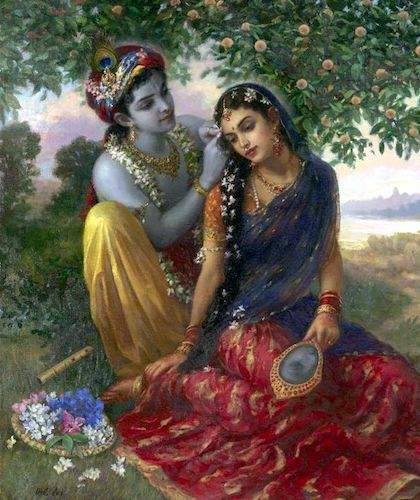 His gunja-berry necklace is sweet, His flower garland is sweet His Yamuna river is sweet, His ripples are sweet, His water is sweet, His lotuses are sweet—Everything is sweet about the Emperor of sweetness! His gopis (cowherd girls) are sweet, His pastimes are sweet, His union is sweet, His food is sweet, His delight is sweet, His courtesy is sweet — Everything is sweet about the Emperor of sweetness! His gopas (cowherd boys) are sweet, His cows are sweet, His staff is sweet, His creation is sweet, His trampling is sweet, His fruitfulness is sweet—Everything is sweet about the Emperor of sweetness!